C. H. and LaVerne Alderman. Oil on board, 22 by 48 inches. Sometimes called a “Pre-Highwayman,” Clarence Alderman was born in Sarasota in 1902. As a child he moved with his family to Ft. Green, about an hour east of Bradenton. He dropped out of school in the eighth grade to help provide for his family. Alderman worked full time at a local sawmill to earn one dollar for a days work, and was almost killed in a hurricane while working in a sugar cane processing plant in Bell Glade. He left Florida for a number of years, joined the merchant marine, and traveled to England. Returning to the States, Alderman traveled west to Grand Junction, Colorado where he met Laverne Bruce. They were married in 1938. While in Colorado he watched an artist at work, took a few lessons, and began to think he could earn a living as an artist. The Alderman’s returned to Ft. Green in 1946 with three children. Here he worked on a farm and he and Laverne drove school buses. 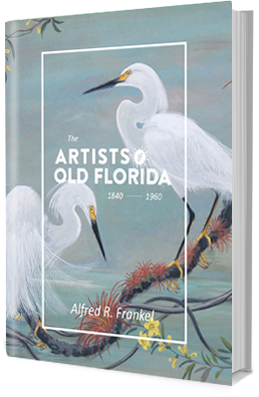 Clarence remembered, and painted, scenes from his early Florida childhood. He worked only on Masonite board covered with several coats of shellac, refining his technique to smooth brush strokes that made his paintings seem real. The Tampa Tribune of August 13, 1953 said of Alderman, “A talent for painting primitive landscapes and a mobile studio have opened the way for escape when the daily routine grows tedious for a Bowling Green farmer. Born: February 12, 1902, Sarasota, Florida. Died: May 1977, Ft. Green, Florida.